Most successful businesses are as such because they meet or even anticipate customer needs. How do they know what their customers think? Simple: they listen to them. Some companies have resilient and productive relationships with market research companies, or similar in-house systems and teams to provide prospective / customer feedback. Many face-to-face research and evaluation projects within businesses provide useful insight. To complement this, many are turning to the fast moving and engaging tools offered by social networking. For many small businesses social networking provides one of the most cost effective ways of passively and actively engaging with customers. The need for customer insight is one of the key reasons that I encourage clients to engage with social media and specifically social networking as a route to listening rather than just a broadcast tool for sales or marketing campaigns. Listening on social media is vital. This is about getting into the depth of published material (in a range of forms), and offering conversation. In terms of relating this to product or service development, this is essential to informing your companies direction of travel. Engaging with prospective / customers in their own environment, on their own terms is a valuable opportunity. As well as generally engaging with prospective / customers, by offering advice or information within conversation you profile your products and company with much more integrity. Relationships are developing and already you are likely to be closer to anticipating and meeting customer’s needs but without a brash sales push. Starting to introduce elements of your company into conversation on social media, brings us back to broadcasting on social media (i.e., promoting events, offers, products etc without invitation or as a means of engaging). Stay with me here please because I admit that many marketing companies don’t agree with this: Values-led businesses should not rely on promotions through social media as the foundations of their social networking activities. Remember, people form relationships. On social media you need to give your potential customers something to relate to within your business. As a brand or company on social media it can be useful to consider it as much like a person. So if you broadcast on social media as a brand consider the elements that attract people to people: humour, reality, usefulness, meeting of minds… Use this to form relationships with customers and potential customers. Key to any relationship in the ‘real’ world is listening – the same is true ‘virtually’. In some ways managing a life of a brand or product on social media takes some mindfulness. The brands I relate to best show a humbleness and wiliness to engage before they directly talk to me about what I should buy from them. Are these not worthy human characteristics? In short therefore, if you treat your brand like a modest, sociable person it is likely to form relationships with potential customers for much time to come. Last month I had the privilege of working with some great professionals at ADPR and Drive Creative Studio to run Love Marketing. This was a half-day not-for-profit marketing skills development event at Sandy Park in Exeter. As well as leading sessions based on our collective range of experience we also welcomed the following speakers to inspire and challenge the group gathered. Anna Slingo (pictured above), Social Media Manager from the Met Office on social media strategy and their work as leaders with innovative Twitter moments. Peter Morris, founder and Director of Lockabox on the value of listening to your audience to help you establish and market your product and company values. Jo Middleton, the Slummy Single Mummy on engaging through blogs with some fun and effective stories. I had the pleasure of listening in on a session from Sophie and Kate at ADPR on evaluating social media. They demonstrated how the industry is shifting, how measuring the value of advertising and media is changing within this. We all gained some really useful first hand insight into supporting clients to ensure they get the most from time and money invested in online media. Professional development is important in any industry. The priority of our work, at Anna Lodge Consulting is to help people we work with to understand and develop their values and practice so that they plan and deliver effective marketing that is true to their company’s ethos. Therefore, bringing people together to share their experience with other enthusiastic practitioners is really important part of any marketers work. I believe that everyone in the room at an event like Love Marketing is an expert so I particularly enjoyed running the session on Developing your Marketing Strategy and the discussions around increasing customer base and developing joined-up thinking across an organisation. It doesn’t matter what you do. The values that underpin your company are vital to the success of your marketing and the authenticity and integrity of promotional material. It can help to spend time with colleagues, perhaps as part of an away day, to really clarify what your company values are. Many people set-up marketing plans with very woolly aims in mind. This then translates to ill-defined audiences, unclear briefs for designers and confusing messages in promotion. So pause before you start planning and get your marketing aim clear. Most people in marketing dabble with market research. However, few keep good records of information they gather and sources. Set-up systems to record market research in your files so you can use it again later, and so that you can trace the most up to date research available. Make sure you are abiding by data protection laws and practices relating to the storage of information and data, and its disposal. Most people forget to evaluate their marketing plan which can mean it can become ineffectual quite quickly. Evaluating regularly, on a cyclic basis, means you pick up problems and potential opportunities much more quickly. Plus you can communicate about your plan to colleagues with much more integrity and more easily. Having a marketing plan doesn’t kill creativity, it encourages it! If you have a plan you can set to work with the interesting and fascinating world of effective communication – allowing you to commission great design, inspiring copy, events that change the way people work. Like all things in life, marketing is complex and often the route to success is not simple. Therefore, the plan will give you and others the ability to follow a process that ultimately should lead you to success. And note- because you are evaluating as you go the place that you arrive at might be exactly where you expected… or it might be somewhere even better or more useful! Yes – we do love marketing here! In July we will be working with two other teams to deliver a new event, a not for profit conference in Exeter focusing on sharing our skills and experience with people in the region: Love Marketing. A team of local marketing, design and communication experts have joined forces to launch an interactive training event for any South West company looking to improve its approach to communications. The event, which is taking place on Thursday 7th July at Sandy Park in Exeter from 2pm for the afternoon. It is being organised by a collaboration of top marketing experts from across the South West – ADPR, Anna Lodge Consultancy and Drive Creative Studio. 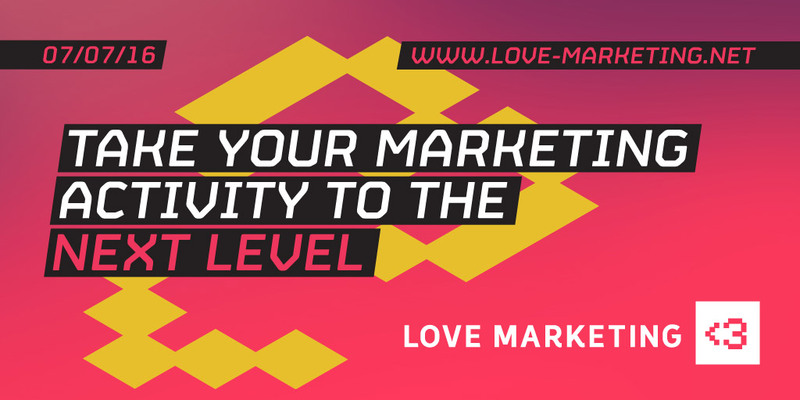 Love Marketing, is for anyone involved in marketing – whether new to the industry or already an experienced marketing practitioner. The event will go beyond the typical sales and marketing training courses. Kicking off with three inspiring keynote speakers from the region and followed by a wide selection of focused skill sessions, Love Marketing will empower attendees to develop their own highly effective marketing programme, using proven strategies for effective sales models, marketing, branding and PR. Delivering key note speeches will be young entrepreneur, Peter Morris – from Lockabox.com, Jo Middleton – from award winning blog, Slummy Single Mummy and social media manager at the Met Office, Anna Slingo. Delegates are then invited to choose from a range of interactive sessions covering topics such as: sales models that work, making the most out of your PR, from product inspiration to developing a marketing strategy, measuring success and monitoring progress online, and getting buy-in from your board and staff. Refreshments will be available throughout, and attendees will also have the chance for informal networking with other people from across the region. Love Marketing tickets cost £45 +VAT per person or £80 +VAT when purchasing for two people from the same organisation. Love Marketing is a not-for profit event, with all revenue after costs being donated to Local Heroes – an Exeter based charity that helps schools address issues of intolerance and discrimination. For further information and to purchase tickets, please visit www.love-marketing.net. Whatever career, job, role you have – make sure it is one you love. I just heard someone say ‘happy new year.’ I kid you not! It is February and there are daffodils out, if you please. Love what you do, and when you can, do what you love. As an alternative to this need to physiologically and professionally detox I feel captured in this phrase above is all the ambition I need any time of year. This is a desire to be the best I can, looking for the right place to be. And help others by doing the best I can, and loving what I do. This won’t translate every moment at my desk to bliss. But I genuinely don’t expect that. Getting to a place of satisfaction with the work we do takes hard work and quite often frustration and pain. Sometimes for considerable time. But the aspiration is to be in the right place doing the right thing, with the right people, however hard that is sometimes – what is not to love about that? And if I am wrong? Well you know where to find a few dozen blogs helping you exercise whilst you work, drink the optimum amount of green tea, and route to finding the perfect coach…. On you go… and Happy February (again). This is quite a common phone call. Good news is: we can probably can get your marketing strategy on the move by the end of the call. However, just a moment now, before you totally think this is (hum) a piece of cake, let us just have a chat about the recipe – by this I mean the perfect marketing recipe for you. Each organisation and business will have its own character and getting the mix of material, routes to market, timings, features just right in a marketing strategy is a bit like baking the perfect cake. Lesson: It takes trial and error to find out what works for your organisation. Writing a marketing strategy is a unique undertaking just for you and your business. There may well be things that you would assume would go in a marketing strategy: asset production that you have tried and tested, branding that works, social post timings that deliver. Additional to your own learning, to improve your strategy there will lots of experience from other marketers across the world that we can use to improve, and tweak the recipe. Lesson: Take what works and incorporate it (doesn’t need to be all new to work like new). Lesson: There is no silver bullet. So take your strategy, work it, review it, work it again. It takes time to map out the new strategy properly, although you can get started with some obvious changes pretty swiftly. However, probably more important to stress, it takes time for the marketing strategy to work. So factor that into the timetable, and set milestones that are immediate, and more distanced. Lesson: Keep notes on what you do, adjust, try. It is really important to evaluate the marketing strategy so that it can live with your organisation and develop alongside. So back to the phone conversation and the first question I would ask is “what do you want to achieve with your marketing strategy?” Once we have that in mind the plan will follow. Lesson: To avoid writing a marketing strategy for the wrong thing, decide your purpose before commissioning a marketing strategy. 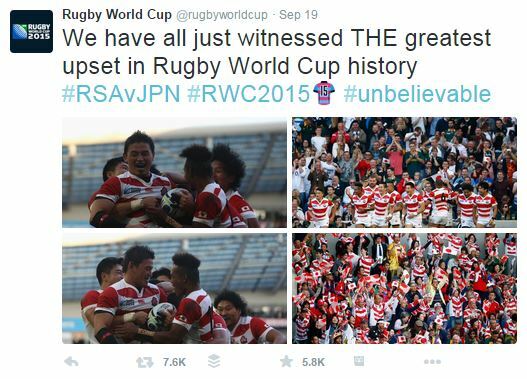 Last night, much to the surprise of the world, Japan won their match against South Africa in the Rugby World Cup. They have been working to beat South Africa for several years, the pools being drawn relatively early in Rugby World Cup. In the final moments, with the chance of a penalty shot and a historic (enough) draw they chose to play the ball which led to their overall win. Amazement, jubilation and supporters in the crowd and the team all started crying. Work hard: That working to a goal for several years can end in nothing but is possibly the only way it might end in something amazing. Patience, diligence, practice and commitment: all required for whatever the goal is. I prefer not to advocate for lucky breaks but hard work. Luck is just a bonus. Real team work: In that moment where you need to decide to take a risk (to go for 5 points rather than 3) you need to know that your team are there, without question, and that they have confidence in you even if you end up with your face in the mud. Be brave: Sometimes you can’t overthink a situation – you just have to go for it, for what feels right and run. Needless to say with a plan and a team behind you the likelihood of success as you run is considerably higher. Cry: When something goes well there is nothing wrong with crying. Be moved by what you can do. And be moved by what others can do. Things that matter are done with passion. I adore the fact that the Rugby World Cup is bringing moments like these stadiums around the UK. But what I love more is that Japan’s against-the-odds win is beautiful in itself and it can remind us what it is to work hard, try and then win or lose with passion. Game on. A) the calm but effective multi-tasker? B) the dramatist telling me about their range of deadlines, fatigue, rushing up and down roads in heels to get to meetings that have already started….? Book meetings, book time to prepare, book time to do tasks following, put a buffer of 15 minutes in-between meetings. Book thinking time, move thinking time, add more thinking time. Working time on bids goes in the diary, working time on client’s drafts…. Everything is allocated against time and moved around in real time as the needs of the day and week change. Real time is that which it might actually take rather than ‘imaginary consultant time’ (which is reportedly fluid and takes on a sort of matrix like quality where you can do three things at once). Simply accepting that you will not always complete a task in an hour or a meeting in two takes the stress out of the occasion. One the people I respect the most is at his calmest when I know he is on a deadline (which is most of the time). This has greatest effect in meetings where it really focuses the group, ensures they feel listened to and sets them up to feel the urgency but not the stress of the deadline. If you have run out of time on a project or piece of work: Book time in your diary to complete it or at least move it on. Lest it gets forgotten or becomes THAT PROJECT that just won’t move. If you are on a deadline this might mean moving some things off the timesheet that day. But do move them – don’t expect to be in two places or on two projects at once. Nuff said, move on – you just gained some time! Let us not waste it. So here are some of the things I do to take the stress and time out of a problem. Leave it – if you can, literally park it on another desk, in a file for tomorrow. Give it time. Exercise – for me slipping on the trainers and running is likely to unblock a problem and show the next step which means I can move it on, even if not complete. Tea – Oh how many times has the act of making tea given me eyes away from something, again to find the next step. Phone a friend – well probably a colleague. Ask advice, roll the problem over with someone. Usually this is a lot quicker than emailing (which can end up with a 4 page challenge without context which your colleague may not be as delighted with as a cheery phone call). Go back in the process – review a few older notes on the project, talk again to the client about the challenge, rehearse from further back in history to work out the route forward. Ok – obvious? Really obvious? How many of us take on projects because we are: worried where our next commission might come from; that the client will be mad if we don’t and go to a competitor; because we feel we ought to help; because we like to be needed. I am not advocating for an easy life. But to make stuff work it is generally better to be getting satisfaction in what you do – even the problems and really tricky stuff which can be our creative edge. So you better really want the challenge otherwise this job is likely to go on and on and give you a load of heartbreak. And goodness knows how many other projects will disappear as you are in lockdown on something that you are not enjoying. Actually you rarely have to say ‘No’ as directly as that. And in fact ‘no’ is quite a dead end response in any situation. And consultants are solutions people – right? So you can help find the ‘yes’ – even if you don’t do the work. ‘I think Paul in your accounts team would be the best person to pull that data together – do you agree?’ I.e., Not me! ‘Can I see if I can suggest someone from my group of colleagues/associates who would have the capacity and skill set to deliver that project for you?’ I.e., Not me! ‘That sounds like a really exciting project. I am caught up in other projects until January. Could I book in your work for February?’ I.e., Not now! Clients are people too. Senior executives in organisations are often like consultants in their plate spinning roles. So the same challenges that consultants have your commissioners are likely to also. Ask the person commissioning you for a clear brief, milestones, check-in points. They might change and move but start on the same route. Your commissioner might be a little resistant to this to start with (their diary will be as busy as yours and potentially that is partly why they have asked you in). But if you remind them that this will be the smartest way to complete the project in the way they need it, you can usually find some agreed way of managing. When deadlines approach tell your friends and family that you might be a little unavailable, distracted, in need of support. OK – so this is not a chance to tell them how dramatic life is and how important you are to the world turning in your sector. This is a chance to remind them what you do, why you do it and to book in (yes) some time after the deadline to re acquaint, restore and visit. Being a consultant can be a lonely and challenging business. It is (mostly) not like having a job. Dude- where are my colleagues!? So you have to find your colleagues. Some of them might be obvious. People you have worked with before, people you meet at conferences on training courses. But sometimes they crop up in interesting places: Trains, planes, school gates, political rallies, dinner parties… The key thing is, use your intuition. If you know yourself you will probably intuitively know when someone is ‘your kind of person’ with some impressive skills which overlap connect or inspire you. Someone to pick up the phone to if you have that problem that just wont budge….